I tweeted earlier today about an interesting experience last night. I went over to the home of one of my growers to deliver some wine and a check toward grapes purchased last fall - it's not unusual to be paying for grapes from one harvest for many months forward (though I really want to finish things out for 2012!). When I showed up, he had two wines waiting in bags, plus a plate of delicious orange chicken he cooked for his family in some crazy black chumba wumba pot, or something like that. I don't ask questions when the food's that good, and I'd already had dinner. The wines could have been from anywhere, and given the slightly spicy chicken and rice, really the wines could have been white. But they were red. And the first was fairly dark in color. One sniff and it was obviously from the new world, meaning not Europe. That's the first base of blind wine tasting - old world or new? How does one distinguish? It's not easy, but you know it when you know it. A new world wine will smell like fruit, and old world wine will usually smell like soil. So I said, new world, and it's Pinot Noir. And it's Oregon. There was just something about the wine that said Oregon, like a unfamiliar block in town that you know even if you don't necessarily know this part of town perfectly well. This was clearly Oregon, plain and simple. Then I thought - volcanic soil or old ocean sediment? Clearly the latter. Why? Hard to say, but there's a dark fruit aspect to sedimentary soils in Oregon that, again, yuou know it when you see it. I even thought this might be from the grower's own vineyard on Ribbon Ridge, but I said it's either Ribbon Ridge or maybe the neighboring Yamhill-Carlton growing area. I unveiled the wine and...it was my own 2006 Vincent Pinot Noir Wahle Vineyard, Yamhill-Carlton. How interesting. I sort of nailed what it was and where it was from, but didn't recognize it as my own. In my defense, I haven't had that wine in a while and, even when I knew what it was, I still didn't pick up the little hallmarks that I know, or think I know, from that wine. Perhaps it's just aging and changing, but at least it still seemed youthful and pretty good, even if not my favorite style. This 2006 is from a warm, ripe vintage, which I don't usually favor, but I didn't peg it as homebrew. I honestly thought it was "really good" wine from a producer more interested in larger-scaled wine. Ha! So, on to bottle number two. This one was lighter in color, more translucent but a bit fruity smelling like I tend to find in new world wines. For a minute I wasn't sure. It had to be Pinot Noir, but was it from Oregon in 2011, a vintage of more restrained, French-style structure? The flavors said no, this was from Europe. We just don't get the acidity that this wine had, the element so many local wine lovers cite when they say they don't like European wines - they're too dry. I found the wine expressive aromatically, flavorful if lighter bodied in the mouth and a touch short on the finish. I guessed Michael Ganoux Bourgogne, thinking it was from a recent vintage. The wine? 2007 Louis Jadot Savigny Les Beaune Les Dominode 1er Cru. Not a bad guess at all, though a much nicer terroir than simple Bourgogne. With time in the glass, the wine unfolded aromatically - beautiful - but remained tight on the finish. This won't ever be generous wine but I'm sure a few years will soften the finish. The rest is lovely. And the point of all this? Not to brag on the parlor trick of blind tasting. I didn't nail these wines. I can't pick Burgundian vineyards, if that's what you're after. But we did talk a bit about how I think it's hard to pick out wines, not like picking out the silhouette of a loved one, the soft jaw line or the unique shape of one's ears or something like that. The way a person looks, their lovely uniqueness, that's hard to disguise or miss even in silhouette. Wine? Getting close is saying a lot, and though I didn't recognize one of my own children (essentially), I found it interesting to see what I did recognize - something true about each wine. Something you have to listen for, not speak. I love that about wine. After a little Sherry immersion recently, I was inspired to buy a half bottle of Valdespino Oloroso "Don Gonzalo" to see what I thought. This 20+ year solera of wines apparently going back up to 100 years represents one of the intellectual curiosities of Sherry, and Port and many other fortifieds - how the heck is wine this old and this good so relatively reasonably priced, much less available fairly commonly? Peruse a good wine shop and it's not unusual to find table wines from the '90s, even '80s or earlier, from top producers. Pricing is usually steep though. If the current release of a given producer is $50, the 20 year old model might be $150 or more. But in most fortified wines, prices for older wines are incredibly reasonable. Not cheap, but for $23 I purchased a half bottle of wine that's at least 20 years old and really a blend of wines going back decades, a solera where casks of old wine are partially bottled, topped up with newer wine and aged longer, bottled in part again and refilled, etc., so that over time the base wine might be several decades old and the youngest wine in the blend, in this case anyway, is at least 20 years old. Did you follow that? Essentially, this is 20 year old wine with some elements going back perhaps a century, in a tidy little bottle for just over $20. That's cheaper than a bad seat at an NBA game. Sometimes my head spins thinking about things like how. How is it possible? Well, fortified wines aren't exactly trendy, and even if the hipsters have found Sherry, I think people talk about drinking Sherry more than they actually drink Sherry. Supply, meet demand. But if you're adventurous and interested in value, two things I happen to believe are true of me, here's a wine for you. 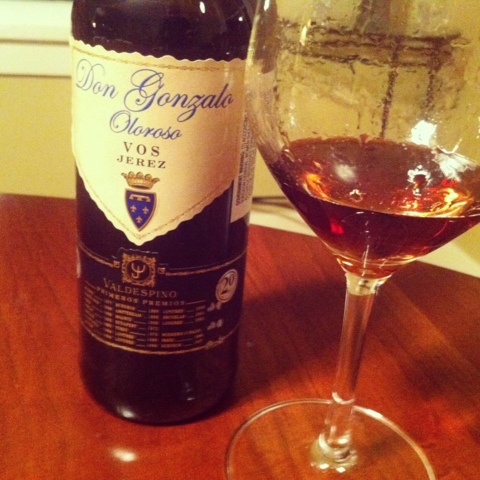 The Don Gonzalo is tawny in color, fitting many years of cask aging. The aroma is pungent of flor, the surface yeast that is a trademark of Sherry, covering the wine surface in not quite filled barrels and giving a signature aroma and flavor you need to experience to understand. There is also a wooden scent, spirity, not unlike cognac. The flavors follow, with lots of roasted nuts, wood spice, caramel and other sweet notes balanced by a medium body, a notable lack of thick syrupy texture, a pronounced saltiness, and an acid spine that carries the flavors to a long finish but cuts the sense of sweetness from the aroma and first taste impression. In sum, the wine is complex and delicious, exotic and a little rancid (in a good way), caramel sweet but almost electrified with acidity that cuts a precise point in the center the wine. It ends up not being that sweet, so you might have this for dessert but pair it carefully with something a bit savory to accentuate the tension in the wine. Or you might just have it on its own after dinner to sip. It's that good. Regardless, try a wine like this. It's like traveling to darkest Spain without leaving your dining room table. It's come all this way and waited so long for this moment, how can you resist?